To preface this article I will begin by saying that these concepts and principles are best explained in more detail in Mike Boyle’s New Functional Training for Sports, which has been an indispensable resource for me in program design. Before we dig into how we approach abdominal training, we’ll first look at the anatomy of the abdominal musculature. In order to understand the function of these muscles in the context of sport, we need to understand their structure. Structure leads to function. The muscles we’re focusing on when we think about abdominal training include the rectus abdominis, the six-pack muscle, as well as your internal and external obliques and the transverse abdominis. Looking at their placement, it’s quite obvious that they play a large role in what happens in terms of movement of the spine. In traditional anatomy, the function of these muscles is to flex the trunk, twist the trunk, and bend to the side. However, when we consider the job of these muscles while playing sports, it’s actually all about resisting movement. The job of the abdominals while playing sports is stabilization, not movement. Think about a football player bracing himself for a hit, or a soccer player about to take a shot. In both these instances, the abs are active in order to prevent excessive motion and keep the athlete in a stable position. In a strength and conditioning context, our job is to prepare athletes for these situations. The plank is perhaps the simplest method when learning to resist lumbar extension. This exercise is one of the first drills we use in order to teach kids to engaged their abdominals. In order to fire up the abdominals, we instruct athletes to push into the floor, and think about engaging their glutes, quads, and abdominals. Doing this will instantly make the exercise more difficult and allow the athlete to learn what an isometric abdominal contraction feels like. The other really important key when performing planks is the breath. The diaphragm is a muscle. 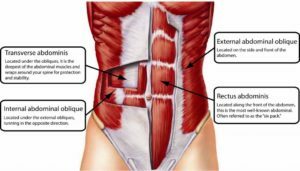 One of its antagonist muscles is the transverse abdominis, the deepest abdominal muscle. A protagonist-antagonist relationship means that when one muscle is contracted, the other is relaxed and vice-versa. At the bottom of an exhale the diaphragm is maximally relaxed, so the TA is maximally shortened. To take advantage of this during a plank, athletes are instructed to perform long, slow exhales, which helps them to actively engage the deep abdominals. The ab wheel is the other movement pattern we use to learn to resist extension. However, it is a quite difficult exercise, especially for those who’ve yet to fully grasp the concept of using their abs to resist lumbar extension. So, we start with the stability ball rollout. Think of the stability ball as a giant ab wheel. Starting in a kneeling position with the abs tight and glutes engaged, the athlete rolls forward, leading with the hips. As the athlete rolls out they must keep their abs engaged in order to keep their spine is a solid position. Even if this exercise is easy for the athlete, I like to air on the side of caution to ensure that they can properly control their spine before moving on to the ab wheel. 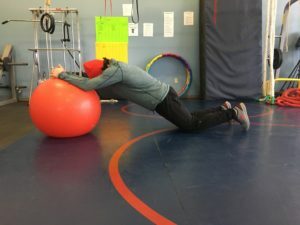 Between the plank and the stability ball rollout, athletes can begin to learn to use their abdominals in order to prevent overuse of their low back muscles. Starting all training programs teaching antiextension will help keep athletes healthy in the long run, and greatly reduce the incidence of low back pain in young athletes. Stay tuned for part 2 of this three part series on abdominal training, where we’ll focus on antirotation, why it’s important for athletes, and how to train it. If you’re interested in applying these concepts, our next athletic performance class session is starting Monday, March 5. You can sign up online or give us a call. “Abdominal Muscles Anatomy.” Abmachinesguide, Ab Machines & Workouts, abmachinesguide.com/abdominal-muscles-anatomy/. Boyle, Michael. New Functional Training for Sports. Human Kinetics, 2016.